AN OASIS of delights await diners during the breaking of fast at The Apartment Restaurant and Bar’s buffet dinner at The Curve and Suria KLCC outlets. 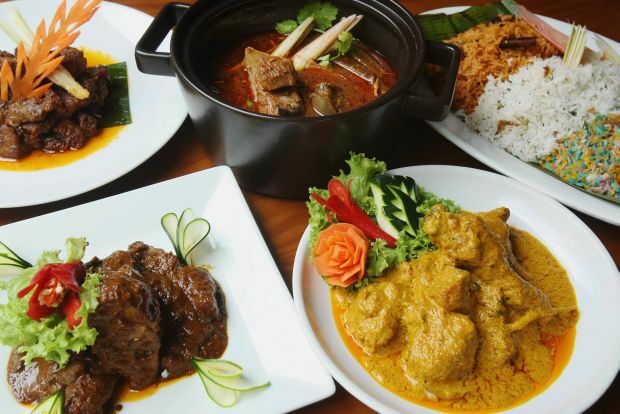 Diners will get to savour a variety of local delicacies along with Eastern and Western dishes tweaked to suit local taste buds at the aptly named ‘An Oasis of Delights’, prepared by The Apartments’ own chefs Mazlan Mohd Hashim (The Curve) and Mohd Azizan Mani (KLCC). Customers will get a chance to try different sets of starters, main courses and desserts as the menu changes weekly. Kerabu Mangga (Mango Salad), Nasi Hujan Panas, Nasi Tomato, Rendang Daging, Masak Asam Pedas Ikan Pari , Ayam Masak Kurma, Curry Laksa, Bubur Pengat Pisang, Bubur Kacang Merah, Pulut with Durian are among the dishes that are available during the month-long buffet. “The Apartment’s food is modelled on Jamie Oliver’s cooking. “The point is we want people to dine and enjoy a homey feeling when they break their fast along with a mix of dishes to choose from,” said the Curve outlet’s operations director Amritpal Singh.. The Apartment regional manager Andy Chin said the buffet had more than Malay dishes to offer. 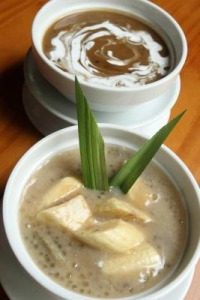 Sweet delights: Bubur Kacang Merah(top) and The Bubur Pengat Pisang(bottom). “This buffet practically has 60% Eastern traditional dishes and 40% Western dishes. There will be four different menus every week,” said Chin, adding that they had teamed up with online fashion shop Zalora where lucky diners stand a chance to win vouchers from the site. “We have two chefs who prepare the traditional dishes from tried and tested recipes from their parents and grandparents. “They are applying what they have learnt about their traditional dishes into the menu,” he said. The Ramadan buffet is priced at RM69.90++ (adult); RM26.90++ (children aged 12 and below) for The Curve branch and RM79.90++ (adult); RM26.90++ (children aged 12 and below) for Suria KLCC branch. With every purchase of ‘An Oasis of Delights’ buffet (both adults and children aged 12 and below) will be given a chance to win buffet vouchers. A daily lucky draw will be held with the Apartment giving out about five vouchers per day as prizes. A RM30 shopping voucher from Zalora will also be given with every adult buffet purchased.